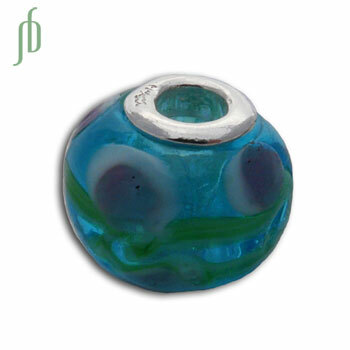 BD402 Lovely turquoise glass bead with with pink flower and sterling silver core. The 5 mm opening size is compatible with Pandora, Troll or 3 mm chain bead charm jewellery systems. Fair Trade jewellery. Sterling silver. Made in Thailand.